Theme: In this meditation, we'll acknowledge the various functions of the physical body that we can consciously utilise. From exercise - to the foods we CHOOSE to ingest - to giving ourselves appropriate rest, and clothing - to recognising all kinds of physical catalyst (feedback). The physical complex is a beautifully designed self-expression. Quote: The body complex has natural functions. Many of these have to do with the unmanifested self and are normally not subject to the need for balancing. There are natural functions which have to do with other-self. Among these are touching, loving, the sexual life, and those times when the company of another is craved to combat the type of loneliness which is the natural function of the body as opposed to those types of loneliness which are of the mind/emotion complex or of the spirit. USA BEGAN DAYLIGHT SAVINGS. YOU ARE BACK AT 10AM EASTERN FOR THE NEXT 6 MONTHS. OVER AND OUT. This week's crash (in Ethiopia) took the lives of ALL on board. All 157 human souls. Factor in their families, friends, and work colleagues, and it's a conservative 30 other people (for each person) that have lost someone dear to them. Those 157 people may have departed the physical, but there are lives of 5000 or more people who have been affected by their deaths. Let's offer a supportive thought to all those affected. Death is one of the major catalysts in 3rd density. Quote: 34.6 Questioner: Thank you. Can you give me examples of catalytic action to produce learning under each of the following headings from the last session we had… Can you give me an example of the self unmanifested producing learning catalyst? 34.14 Wrote: This may be seen to be what you would call a traumatic progression. It is to be noted that among your entities a large percentage of all progression has as catalyst, trauma. Theme: there is an understanding in western society of having 'strings attached', and having 'no strings attached'. When you give something with 'strings attached', it is not really a 'Gift' as such. In that there are some conditions, or expectations. When something is given 'NO STRINGS ATTACHED', then it is truly set free - the GIFT is given to the other person WITH NOTHING required in return. Ra describes this quite eloquently as a green-ray energy transfer - in terms of the underlying energy. But this GREEN RAY GIFTING can apply to all forms of sharing: whether it be physical (bodily), mental (emotional), or spiritual (beyond words). True Gifting has no strings attached. The Gift is free to go to the other person, in the way they can best perceive it. (and it's mutually recognised as having no strings attached). thus the gift, shall we say, being given freely, no payment being requested either of the body, of the mind, or of the spirit. The green ray is one of complete universality of love. This is a giving without expectation of return. Theme: We'll just share some thoughts with Archetype 7 today. The Great Way of the Mind. 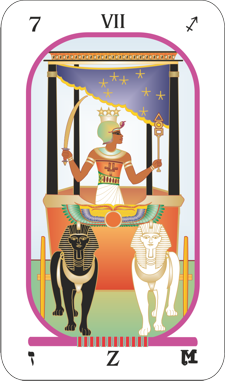 The Chariot Archetype. 74.91 Wrote: Ra: I am Ra. This is most perceptive. The Archetype Seven is one difficult to enunciate. We may call it the Path, the Way, or the Great Way of the Mind. Its foundation is a reflection and substantial summary of Archetypes One through Six. NOTE: if you are in EUROPE, your time has moved forward by ONE HOUR due to daylight savings. You can sync to 3pm London time. Theme: out of a planet of 7 billion human beings, one can still feel very disconnected and lonely. How can that be? Well - if one identifies as a 'Wanderer', one feels that one is fundamentally different in some way. In one's values, ethics, and expectations. There is just a difference in quality of approach. How wonderful it is to find one's friends and associates then! So in this meditation, we'll just acknowledge those deep personal connections and relationships. How truly NOURISHING they are. Quote: 83.17 Questioner: Could you expand on what you mean by that interaction of polarized entities in piercing the veil? Ra: I am Ra. We shall state two items of note. The first is the extreme potential for polarization in the relationship of two polarized entities which have embarked upon the service-to-others path or, in some few cases, the service-to-self path. Secondly, we would note that effect which we have learned to call the doubling effect. Those of like mind which together seek shall far more surely find. 50.5 Wrote: The second program involved agreements with several entities. These agreements provided and will provide, in your time/space and space/time continuum, opportunities for the experiential catalyst of work and comradeship. We have some new times for the Saturday Meditation. Theme: food is one of those exceptionally great catalysts. We eat everyday. We can cook ourselves. We can eat out. We have a fair degree of choice in what we put into our bodies (and how much). It can help us focus and pay attention! We will thank and acknowledge the experience of Food in this Meditation. 40.13 Wrote: Ra: I am Ra. This is partially correct. The other portion of healing has to do with forgiveness of self and a greatly heightened respect for the self. This may conveniently be expressed by taking care in dietary matters. This is quite frequently a part of the healing and forgiving process. Your basic premise is correct.